Most people are generally unaware of the hazards of poor indoor air quality and the health risks they pose. The EPA states that the air we breathe inside our workplace can be 2-5 times more polluted than outdoor air. Whether it is due to a lack of ventilation, odour, chemical fumes, pathogens, dander, mould or pollen these pollutants not only create negative perceptions but are also detrimental to health. However, due to costs and constraints, it is not always possible to deal with this issue in areas such as washrooms, corridors and basements. Ecobreeze is an effective extraction and air filtration system that removes odours and indoor pollutants, especially in areas that have little or no ventilation. Ecobreeze also emits a fragrance to create a tailored and evocative ambience. 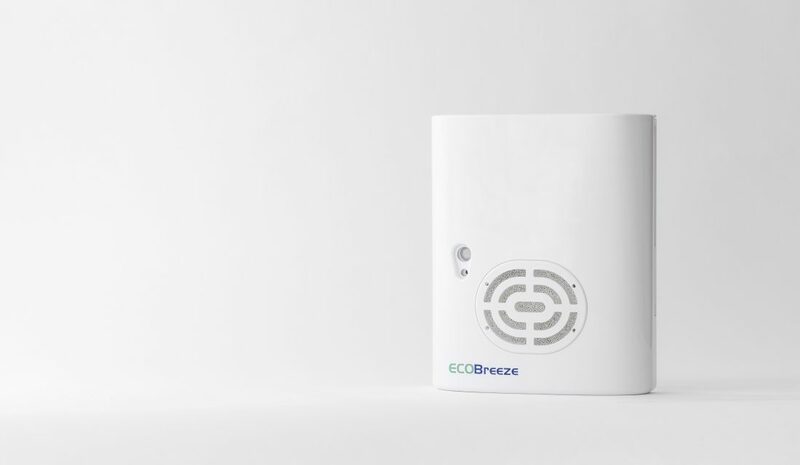 Ecobreeze is patented, independently verified and scientifically proven by UK and US based laboratories making it the safest option for delivering an invaluable commodity – fresh and fragrant air. Please click here for an overview of what makes us different. Ecobreeze’s patented design ensures optimum performance without the use of ozone, biocides, ionisers or aerosols. Because we can’t usually see hazardous air particles, we assume it’s all clear. The only time we notice and associate bad air is when we smell odours. Conventional methods of dealing with these malodours in fact contribute extensively to indoor pollution. Ventilation and conditioning systems do not always effectively deal with odours and will only circulate polluted air. Additionally, masking bad odours with VOCs can cause health issues.